I find myself in a melancholy mood tonight. It's the end of an era. A good long run has come to a close and I'm not sure I'm ready to say goodbye. So many good times were had, and yet, I have to accept that things change, that sometimes it's best to let go. 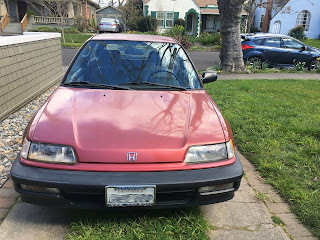 I bought my Honda on January 7, 1990. It was only 7 miles old when I found it sitting on a lot, all shiny and beautiful in the falling rain. 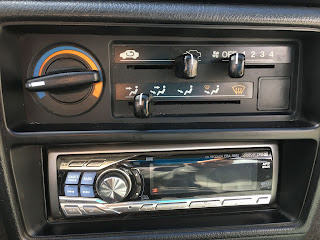 I took it for a test drive, marveling at the peppy 5-speed manual transmission and the fact that when I stepped on the gas, it not only went forward, it actually went quickly (I was driving a 1971 VW bug at the time, so it wasn't a very high bar). And the color! Sonoma Red. The stars couldn't have been more perfectly aligned. I sat down with the sales guy and danced the dance, you know the one. "Let me check with my manager and see what he is willing to do. You're asking for a lot, you have to let us make a little money on this, right?" In the end, I paid $10,000 for it, probably not the best deal ever made. I shook on it and promptly felt a little nauseous. It was the biggest purchase I had ever made on my own at that point in my life. Come to think, probably the biggest one I will ever make by myself —in October of that same year Mark and I got married. From then on, all purchases have been made mutually. From the official Honda Civic brochure, which I still have and will pass on to the new owner. Note the hot 1.5 liter engine. 92 horsepower! This car has been amazing. It truly is bigger on the inside than it looks on the outside. The back seats flip down flat and it has the capacity of a small truck. We helped friends move, transported bags of soil, loads of lumber, stacks of bricks. We carried a succession of big dogs back and forth to the vet, to the beach, to the lake. We were able to fit two adults, two dogs, a full sized ice chest, sleeping bags and an overnight bag in that car and it still managed to get up the hills to the coast and back. And that was at the ripe old age of twenty-seven. The little engine that could, and still does 28 years later. If dog years are seven-to-one, what are car years? I'm not sure. I am sure we have the oldest car on the road that is still running on the original clutch and engine, at least that I personally know about. Sure, it leaks a little oil and in a heavy rain, water seeps in through one of the taillights. The throwout bearing has been making a growling noise for a while now, but our mechanic said to wait until the clutch goes out, so he can replace both at once. That was about five years ago. The clutch, so far, has held out. We cleaned it up last weekend, using an entire roll of duct tape to lift generations of dog hair out of the carpets. Mark pulled the ashtray out of the dash and found a tiny sand dollar, the very one we found on the beach on one of the car's first road trips. We had gone to Point Reyes in celebration of the 2nd anniversary of our first date. We decided to leave it in there; somehow it doesn't belong anywhere else. 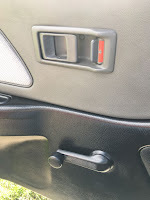 crank windows and non-electric locks. Hey, less to break! Custom stereo and high tech heating system. 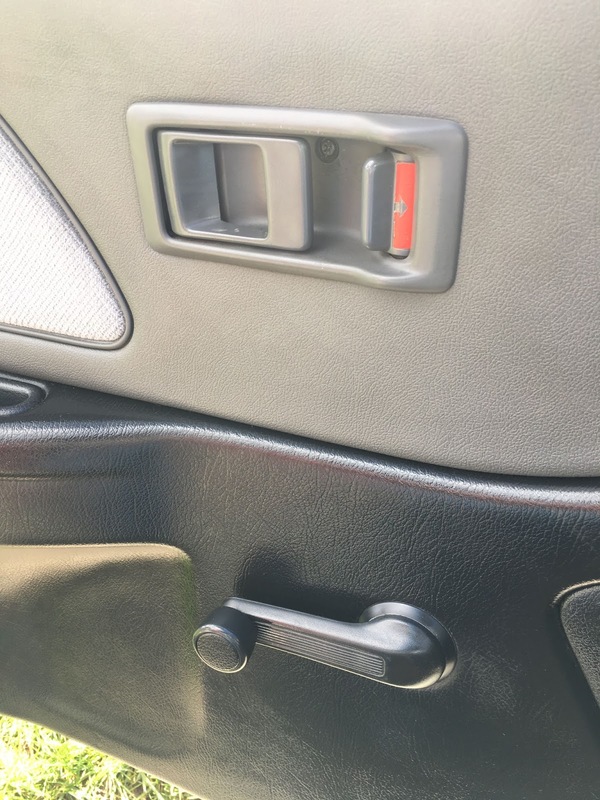 No A/C of course, that's what the crank windows are for. It's a funny thing. When you have something so long it becomes wrapped up with people and events in your life. I've had that car more than half my life. It seems so strange to say that. I remember driving my first dog to the vet one day and getting that dreaded diagnosis: cancer. Up to that point, our dogs always had to stay in the back cargo area. After the appointment, I loaded her up into the passenger seat next to me, face streaming with tears. "No more back seat for you," I promised, "you can ride shotgun from now on." It's strange to think that there is probably a stray hair or two still embedded in the seat from that day. The Honda was our carpool car when Mark and I worked together the first seven years of it's life, the car we took to the grocery store, the mall, the airport, the local hiking trails. We crammed family and friends in the back to go to dinner and movies. I gave my father rides to his doctor's appointments when he was seriously ill and drove Mark to the emergency room after a few unfortunate accidents. We arrived to weddings, baby showers, parties and funerals in it. When they saw it around town, friends always knew which one of us was driving by how it took the corners; I'll let you guess who went the fastest. In 2006 we decided to get a new car. The Honda was getting up there, and with gas prices rising to $4/gallon it was getting really expensive for Mark to drive the truck back and forth to work. 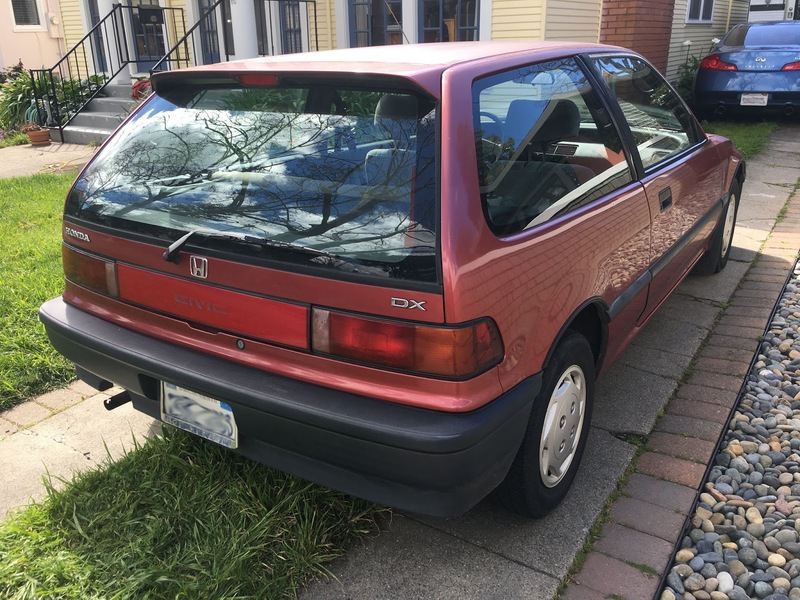 At that point, the Honda became Mark's daily driver. 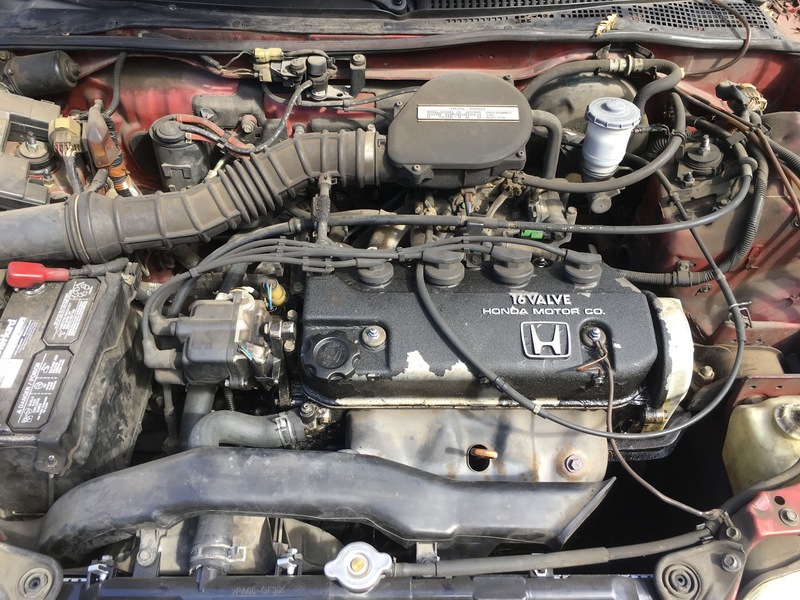 We figured it would last a few more years and we'd eventually look for a small car to replace it, maybe another hatchback that got good mileage. Twelve years later, he finally found what he was looking for, a brand new shiny Ford Focus ST (that stands for Super Terrific, just ask him). The Honda, with the bratty new car lurking in the background. 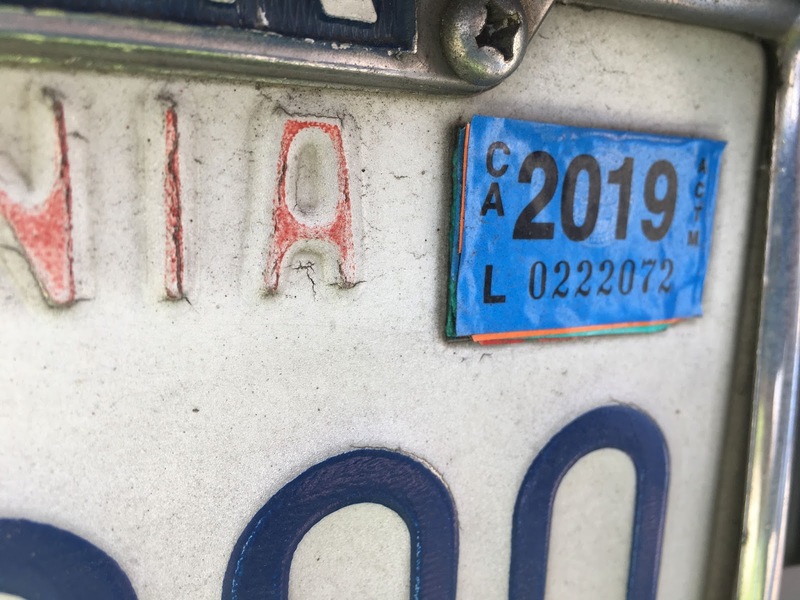 There are so many registration stickers on the back plate they're a quarter inch thick. 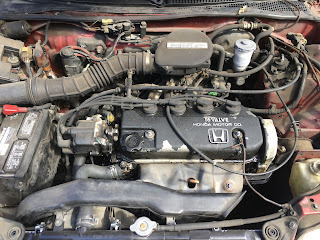 I couldn't bear to turn the Honda over to the state for the rebate. I know it's got more miles left in it, and I know someone with the right state of mind and a light clutch foot will appreciate it as much as we have. We spent the weekend cleaning it out for it's new owner, a guy from my work that lives in the neighborhood. I take comfort in the thought that I'll still see it in the parking lot during the week, and that it will still be tooling around town picking up groceries or going out to the coast. As sad as it is, it's time. 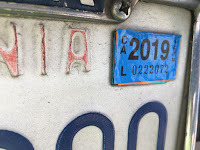 All I ask is that this new car holds up as well; I expect it to continue running on it's original engine and clutch through 2046, twenty-eight short years. At that point, we'll be faced with a dilemma: find another sporty hatchback (maybe one that flies?) or surrender our driver's license since we'll both be 82 years old by then.